The Basic Kitchen Co. | Kitchen Renovation Services | The Basic Kitchen Co. If you are considering updating your kitchen, be sure to search our archive of articles for kitchen renovation ideas. You’ll find suggestions on cabinets, countertops, backsplashes, sinks, flooring, appliances, fixtures, and more, which you can incorporate into your kitchen remodeling project plan. Here are 12 spots in your kitchen where mold could be lurking, and a few ideas for getting rid of it and keeping it away for good. Plastic, while an amazing and ubiquitous convenience, is often viewed more as a growing health and environmental threat than a savior. Here are 8 reasons to stop using plastic in your kitchen and throughout your home. Does Baking Soda Really Deodorize the Fridge? Baking soda in the fridge does work, to an extent, as long as you follow a few rules. Read on to learn what makes baking soda an effective deodorizer and how to best use it to refresh your fridge. Here are eight of our favorite kitchen inventions that might just change your life—or at least change your meal prep routine. A kitchen island doesn’t need to be big to perform its duties. Take some design inspiration from these small kitchen islands, then consider recreating the look in your kitchen, whatever the dimensions of your space. When revamping lighting design, it’s smart to consider everything from function and fixture to the type of light bulbs you use to address common kitchen lighting challenges and ensure optimal illumination for all your needs. Proper lighting is crucial to a kitchen's functionality, and the lighting fixtures themselves can pack a real punch style-wise. If you're wondering how much time your appliances may have left, check out these guidelines on how long you can expect your appliances to last. The middle of winter may not seem like a good time to start a renovation project, but the season has a surprising amount of DIY appeal. It’s possible to clean and restore your grout using common household products and a bit of elbow grease. Use these shopping tips and recommendations—based on satisfied consumers’ reviews—to find the best interior paint for the job. Whether shopping in-store or online, the ideal time to purchase depends on the type and model year of the appliances you have your eye on. Open concept living has been losing ground as buyers turn to cozier, more energy-efficient houses. Here are just a few reasons you may want to pass on that open floor plan. Whether your cabinets are painted or finished wood, they’ll perk right up with a few common household items and a bit of elbow grease. If you’ve been wanting a tile floor but shied away due to the difficulty of installing your own traditional tile, you may be intrigued by the idea of a floating tile floor. That vital kitchen appliance may hang in there longer than you think, but it won’t be around forever. Learn how to extend its life—and when it’s time for a new one. To find out if this material is right for your budget, lifestyle, and aesthetic preferences, first consider these pros and cons of laminate flooring. Learn what types of marble are available, how to choose the best one for your budget, and glean some DIY tips should you opt to tackle installation yourself. A cutting board acts as a chopping block, food preparation surface, or serving station—sometimes all three. So it’s essential that this can’t-live-without kitchen accessory be made of a durable material. Before putting on your work clothes and picking up a scraper, get to know the two methods for removing texture from walls depending on whether or not your walls are painted. Your bad cleaning habits may be preventing you from achieving a real deep, lasting clean. Simply follow these 12 tips for your healthiest home ever. Understand the strengths and potential drawbacks of seven best kitchen sink materials so you can make the right choice for your kitchen remodel. Is your water too hard? Here are just a few of the tell-tale signs that you may need a water softener. Taking steps to reduce bacteria growth and following a proper cleaning routine can erase past odors and minimize future scents. The kitchen is one of the most popular spots in the house, so it deserves to be brightened with a bit of nature. Try finding a place for one of these easy-care houseplants that thrive in the kitchen. Before you take a rag and the nearest cleanser on hand to your dingy oven, study up on the right and wrong approaches to getting your oven spotless. There’s an art to getting this architectural feature in perfect proportion with the rest of the room. Follow this advice and your wainscoting will stand out for all the right reasons. Whatever the cause or location of the clog you're dealing with, you'll find the right fix in this capable collection of plumbing tools. An island can hog precious real estate in a cookspace, so consider this three-sided workstation, storage, and snacking solution. Before you start tearing apart your kitchen sink area to swap in a new, more stylish faucet, get to know the process and any obstacles that might slow you down. If you want a pest-free kitchen, the name of the game is CLEAN. You’ll be more successful in deterring bugs if you keep crumbs and food waste to a minimum. Understand the pros and cons of this narrow yet highly efficient design to see if it might work well for your cook space. With all that goes on in today’s kitchen, it’s crucial that the floor can withstand high foot traffic as well as the all the inevitable spills and spatters. Take the guesswork out of your kitchen remodel with this foolproof guide to determining the perfect countertop height for comfort and ease of use. House ants enter kitchens through cracks in windows, doorways, or floors in search of morsels that might replenish their own colony’s food and water supply. Read on to learn how to get rid of kitchen ants permanently. There are plenty of standalone kitchen islands to fit your needs, whether that's style, size, storage, or all of the above. Here's a roundup of the best kitchen islands for under $500 whether you have a big kitchen, little kitchen, farmhouse kitchen, contemporary kitchen, or something in between. Got some spare space in the kitchen? Consider adding a breakfast nook! These 15 photogenic options suit a range of kitchen styles and sizes. Got some spare space in the kitchen? Consider adding a breakfast nook! These 15 options suit a range of kitchen styles and sizes. Are you dealing with a dripping faucet, low water pressure, or clogged pipe? Here are 10 basic plumbing secrets every homeowner should know. Maybe one of these could save you a costly visit from your local expert. Learn what features and horsepower are best to grind and get rid of your family’s foodstuff leftovers. Unlike natural stone, laminate, or solid surface (made of mineral dust and resins), tile offers endless creative possibilities for your kitchen countertop. Yet, as with any countertop material, has its own set of drawbacks. When you're paring down your renovation budget there are a few places you can't scrimp. When it comes to the floors, however, there's room to negotiate. If your floors are ugly and dated yet structurally sound, there's an alternative to replacing them outright: Paint. If you notice water on your kitchen floor, understand common causes and (mostly) easy fixes. Understand the key discrepancies between these two often mixed-up materials to make an informed choice for your new countertop. Before you can paint your kitchen cabinets, you must make a few key decisions—what type of paint to use, and in what sheen and color. To save yourself from dangerous and costly dishware dilemmas, check out these 10 indestructible items, which are built to last for years. clever homeowners can think outside the box and use their appliances to accomplish a multitude of unexpected tasks. Each kitchen appliance has a designated purpose, whether it’s toasting bread, making coffee, heating up food, or mixing ingredients. But clever homeowners can think outside the box and use their appliances to accomplish a multitude of unexpected tasks. Here’s how to clean stovetop drip pans with nothing more than household items and some elbow grease. Enlist this little-known, low-cost product to restore the original color of your grout or give it a brand new hue. Slap a fresh coat of color on those Formica cabinets and countertops. This guide will help you makeover your kitchen or bathroom surfaces in a weekend—and on a budget! Follow these steps to size a granite slab or tiles to a perfect fit for your new countertop or backsplash. Despite their durability, countertops can suffer from costly damage. Here are 10 common culprits that cause homeowners to unintentionally ruin their countertops. Eating healthier is a common New Year's resolution and there are plenty of ways to make this pledge a success. Check out these promising kitchen gadgets that promote healthy eating. While there’s a vast array of choice on the market now, designers and contractors do have their favorites — from techy touches and savvy storage to the newest colors, finishes, and materials. Find out which trends will rule in 2018. The trend in 2018 will focus on upscale renovations with a luxury feel. Small home theaters (seating for eight or fewer), wet bars, and open entertainment areas are good bets, but skip the wine cellar if you want to draw in potential buyers. Both satin and semi-gloss finishes can lend a beautiful sheen to any interior paint job. If you’re stuck between the two, read this guide to help you determine which coat to put on. To maintain its glossy shine, granite should be cleaned regularly—and carefully. Here's how. Follow these tips to make sure your refrigerator is functioning at the ideal temperature. In addition to filling gaps and making the joinery look flawless, this sealant serves as an important barrier to keep both critters and drafts out of spaces where they shouldn’t be. Feeding your garbage disposal the wrong items is a surefire recipe for bad smells, clogs, and ultimately, a broken appliance. Get your smoking oven to cool off with these no-sweat solutions. Create better-tasting meals with an always available array of fresh herbs right at your fingertips! If your kitchen sink is raising a stink, neutralize the situation with one or more of these seven fresh solutions. When it comes to stocking your kitchen with gear, trust only the best brands and products. Here are 10 long-lasting picks we trust. It's tempting to think that your dishwasher gets a good cleaning every time you run it through a cycle, but that's unfortunately not the case. Here's how to keep it sparkling clean, sweet smelling, and effective. Do you suspect that your freezer is slacking on its one job? Then act fast before the day comes that you open the door to find melted ice cream, spoiled meats, and puddles of water. These tricks will help you quickly identify and fix the problem before any food goes to waste. If your garbage disposal is starting to stink, there’s help for it. Follow this quick video advice to freshen your sink and get a cleaner smelling kitchen. Suspect a leak in one of your kitchen's hardest working appliances? Troubleshoot the problem and repair a leaking garbage disposal with these tips and techniques. Kitchen countertops must be updated eventually. With DIY countertops, homeowners enjoy not only savings, but one-of-a-kind results. If you've opened your dishwasher to find a sudsy puddle on the bottom of the appliance, follow these troubleshooting tips to take care of the underlying problem yourself. Whether you're looking for a large farmhouse-style table or you need something that fits a tiny space, get inspired by these stunning and easy kitchen table DIYs. Sanded vs Unsanded Grout: Which Do You Need for your DIY? Don’t get caught at the home center trying to discern the difference between sanded and unsanded grout. Find out which type is right for your project with this guide. Ready to re-do your flooring, kitchen backsplash, or bathroom walls? Check out our guide to five popular tiling options on the market today. Weigh these key considerations before updating your entire kitchen with butcher block countertops so you can feel confident in your decision. No need to toss—or eat—all of the chilled food before it goes bad. Any of these easy solutions can get your hardworking kitchen appliance running again. Your trash can will probably never smell like a fresh bouquet of flowers—but you do have the power to eliminate the worst of the stench. Get the best performance from your fridge, extend its life and increase its efficiency by periodically cleaning its condenser coils. You might not know that some food items actually go bad when kept at cold temperatures. Keep reading to find out which things you should never put in your fridge. While there are plenty of things you should never put in a microwave, the items listed here are some of the most common hazards. Just remember: When in doubt, keep it out! Take care when loading the dishwasher, and take these helpful tips to heart the next time you do your after-dinner wash-up. Quartz offers striking beauty and like-a-rock durability—a combination of characteristics that make the material an enduringly popular pick. Stained grout makes your kitchen and bathroom tile look dirty. If your previous attempts to whiten yellowed grout failed, try these tips during your next cleaning. If you’re planning some renovations or if you're thinking about resale value, you should consider updating these 10 things that make your home feel outdated. Porcelain or Ceramic: Which Type of Tile is Right for You? Discover the similarities and key differences between porcelain and ceramic tiles so that you pick the right one for your next project. Be prepared! Review these 10 sneaky costs of home remodeling that you could encounter in your next renovation. Maximize the most high-traffic spot in your kitchen by adding a few extras that will amp up the convenience, utility, and style of your space. Not all renovations are created equal. Get the scoop on the best investments you can make when remodeling your home. To ensure a fret-free brick backsplash installation with an enduring, professional-quality finish, take all of these factors into account. Whether you've considered adding subway tile to your home or not, we think you'll find inspiration from these stunning rooms where subway tile makes its mark. Learn the warning signs of a dying fridge so you can be ready when it needs to be replaced, potentially saving yourself from spoiled milk, rotten leftovers, and the stress of making a rushed purchase. It’s all about looks - a way to put a dramatic material, usually natural stone - on display! Read on for details about all the options to see if this splurge is right for your remodel. Protect your pricey kitchen investment with the right sealant and these techniques. 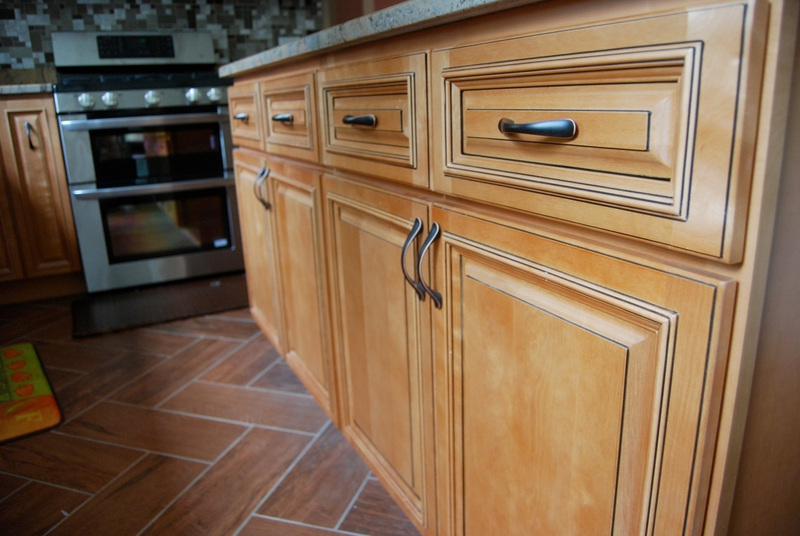 With a simple, effective mixture of common, non-toxic ingredients, you can restore the look of your cabinets, quickly and with relative ease. If your kitchen cabinets are in need of a refresh, pick glaze over paint or stain alone this time to try out a trendy vintage-inspired finish. With a few natural ingredients, you can eliminate the harmful substance without the help of a professional. To ensure a great-looking, long-lasting tile job, get this all-important mortar blended just right. Learn how. Here are a few foolproof ways to get the best home-improvement bang for your hard-earned buck without suffering a case of buyer's remorse. Consider adding one of these gadgets to your kitchen to speed up cooking time and meal prep, simplify clean-up, and generally make you look like a star cook. Hoping to transform a room with trim? Get the lowdown on this elegant upgrade! Before you apply your first coat of wall paint, read this primer to make sure you’re covered. Glass tiles are still enjoying their day in the sun as homeowners continue to incorporate these trendy tiles into their home renovation projects. Silence all squeaks and creaks that occur beneath the subfloor using one of these three easy techniques. Whether you’re taking the DIY route or calling in a skilled specialist, here are few lessons to take to heart before leaping into a home renovation. If your kitchen or bathroom remodel wish list includes natural stone countertops, consider eco-sensitive soapstone. No longer a solely utilitarian space, today's kitchen plays host to a range of activities beyond meal prep and casual family dining. Before you buy the hottest new thing in kitchen convenience, think it over. Will you really use it six months from now—or is this one purchase you're going to regret? Beautiful, durable, easy-care quartz is among the most popular countertop materials available—but it is pricey. Give your kitchen a fresh start this New Year’s by rebooting your pantry. Don't endanger the longevity of your pots, pans, and other kitchen utensils! Avoid these 11 "don'ts" to ensure that you get the longest possible service from your cookware. Hang on a second: Before you decide to take on the hassle and expense of a full-fledged kitchen renovation, consider these inexpensive, easy updates. Why waste money—or put your family’s health at risk—with store bought brands when you can DIY a safe, efficient cleanser for everything from plates and glassware to pots and pans. Try a fresh coat of color to salvage those pieces you’d rather not replace. Durable and beautiful, granite countertops bring a touch of elegance to a hardworking kitchen. Learn more about this luxurious material and whether it's the right choice for your kitchen. Maximize any kitchen space—cramped or capacious—by building a custom kitchen island to fit all of your needs. Longing to uncover an original surface or get rid of unsightly drips? Apply one of the three tried-and-true methods here. When you take on a tiling project, it's always a good idea to buy about 10% more than you'll need for the job. Reduce toxic emissions, stale smells, and stuffy air in your cook space with a combination of these techniques. You may think you keep a clean kitchen, but all of those nooks, crannies, and corners are perfect hiding places for bacteria and other nasty bugs. A few simple steps can keep your knives like new for years to come. Consumer Reports' experts show you how. Consulting by e-mail, pin board, Skype, and telephone, a long-distance designer helps a dark but otherwise great cook space lighten up. See 33 of our top picks for these frequented rooms. Undertaking the gut renovation of her forever kitchen, a seasoned home cook holds fast to two kitchen keepsakes. Everyday items get a second, more illuminating life when you outfit them with plug-in or hardwired cord kits. This Old House plumbing and heating expert Richard Trethewey helps a homeowner install a new, no-touch kitchen faucet. Standout looks spotted at this year's tile trade show Coverings. The 2016 Kitchen & Bath Design Trends report details the features homeowners request most often. A dated cook space gives way to a sophisticated, open gathering place for family and friends. Tiling is complicated. With this 5-step guide, finding a tiler isn't. Stained finishes make for tougher fixes. Give your decor a refresh. To help start that process, we've gathered the latest home trends for spring. Don't skip over these forgotten spots when cleaning your kitchen. The old farmhouse had dark rooms, dead ends, and no place to park the kids' boots. Here's how an inventive redo made an 1830s artifact just right for a 21st-century household. Simple ways to improve your home right now. With its listing walls and sagging roof, this fixer-upper farmhouse was a sorry sight—until two serial renovators gave it new life and a new look. Opening up an isolated kitchen transforms it from a blind alley to the expansive hub of family life. This Old House general contractor Tom Silva helps a homeowner purchase and install a kitchen wall cabinet. Ask This Old House plumbing and heating expert Richard Trethewey helps a homeowner reattach an undermount kitchen sink to a granite countertop. Warm up your kitchen cabinets with a two-tone scheme. Freshen up your cook space on even the smallest of budgets with these savvy ideas. Repairman Richie Isaacson shows host Kevin O'Connor how to maintain kitchen appliances. Norm Abram shows how to create easy access to items in a kitchen base cabinet. Use a peel-and-stick tile mat instead of messing with thinset and a trowel. Annexing the dining room gives this mom of two teenagers an open kitchen where the whole gang can gather. Up your culinary game with a tilt-a-whirl blender, a knife block that sharpens your knives, a perfect-pie-crust rolling pin, and more. This Old House host Kevin O'Connor works with an electrician to help a couple add task lighting to their dark kitchen in Brooklyn, NY. Learn everything you need to know about replacing your cabinetry. Inventive new products offer easy ways to upgrade the kitchen and bath. Here are 28 that caught our eye. How to highlight grid patterns around tiles. Items salvaged from old mills and barns become the floors, ceiling, and shelves in this couple's rustic kitchen. Behold 10 truly outstanding cook spaces from this year's annual Search for America's Best Remodel Contest. The owners of a 1940's cottage blend past and present to get modern function with vintage charm. A lackluster kitchen gets a vibrant new look with updated countertops and a backsplash, plus bright blue paint. In this how-to video, This Old House tile contractor Joe Ferrante tiles a kitchen backsplash with translucent glass tile. What's Their Story? Kitchen Sinks. Learn the history of these sinks that used to take center stage. This Old House plumbing and heating expert Richard Trethewey helps a homeowner repair her leaky kitchen faucet. In this how-to video, Tom Silva shows how to set cabinets like a pro. This Old House general contractor Tom Silva shares his secrets for producing tight-fitting mitered corner joints on crown molding. Hang kitchen cabinets to add storage, paint or reface old ones to refresh the look of your room, and more.